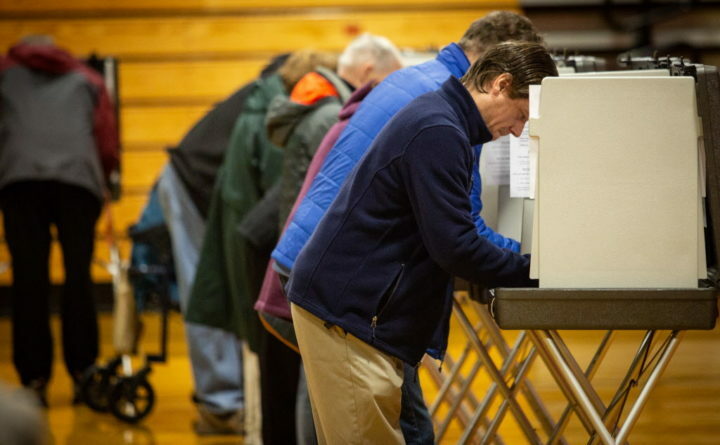 Mainers vote in Gorham on Tuesday, Nov. 6, 2018. Attorney General Janet Mills will be the state’s first female governor after Tuesday’s election, edging out Republican businessman Shawn Moody with 50.9 percent of the votes as of midday Saturday. Independent State Treasurer Terry Hayes came in a distant third with 5.9 percent of the votes with 96.5 percent of precincts reporting. Interested to see how liberal or conservative your town swung in the race for governor? Use the interactive map above by clicking on your town to see how many votes Mills, Moody and Hayes earned. Towns in which Mills won by more than 5 percent of the votes are dark blue; less than 5 percent is light blue. Towns in which Moody won by more than 5 percent are dark red; less than 5 percent are light red. Towns that split the votes evenly between the two are light gray. Towns that are dark gray have not yet reported returns. We will update the results as returns continue to come in. If you want to see how your town voted in local races, be sure to check out our full election results coverage here, and search for your town.